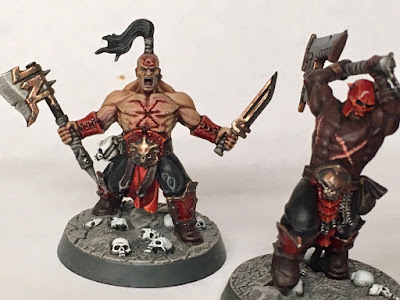 I've wanted to paint some Bloodbound for a while but didn't want to paint a full army. The Khorne Reavers from the Shadespire boxed game were, therefore an ideal choice to scratch that particular itch. I decided to use them to experiment with some new recipes for skin, brass, bone, and red armour. The skin was done with a different recipe on all 5 models - mainly playing with different basecoats, washes or glazes - Seraphim Sepia is a new favorite. The darker skin tones were basecoated with a Rhinox Hide/Bugman's Glow mix to give a reddy tinge to the colour and shaded with Reikland Fleshshade. It was then highlighted up by adding more Bugman's Glow and/or changing the shade of brown. I found the darkest skin tone the hardest to get to look right as it was tricky to get the highlights looking natural; I ended up having to darken the shading using Nuln Oil to give more definition. The brass was straightforward. I tried a new custom wash - Temple Guard Blue and Agrz Earthshade which worked nicely when used sparingly over a Brass Scorpion basecoat. Finished with quick Runelord Brass highlight. The red armour plates were very basic Mephiston Red, highlighted with Troll Slayer Orange and Ratskin Flesh. The only unusual choice was to shade with Incubi Darkness - to try to tie in the red shading with that of the brass. This was then finished with a glaze of Bloodletter and a coat of 'ardcoat (gloss varnish). 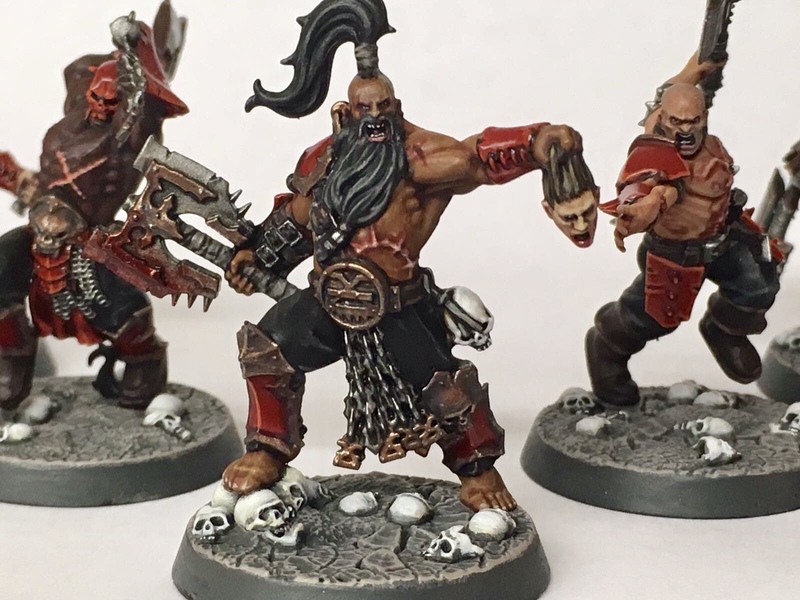 I accidentally came across new recipe for bone when painting the bases. 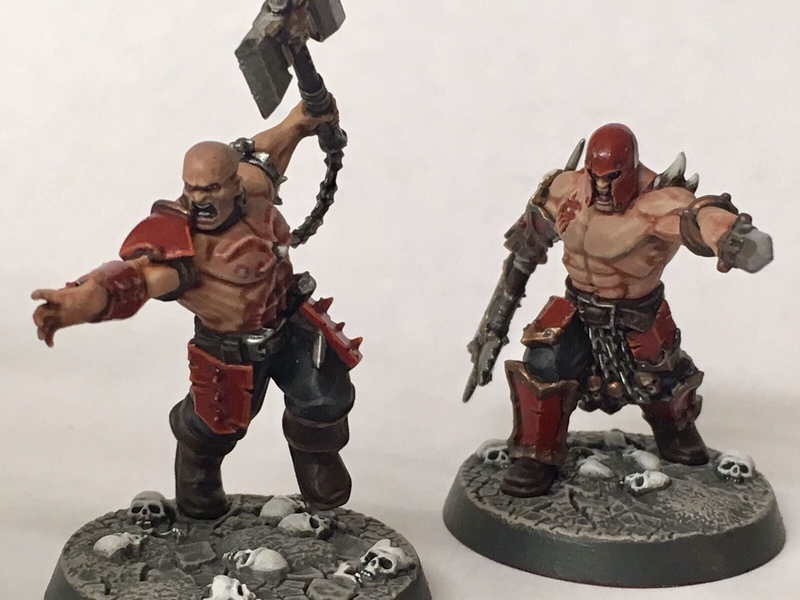 I started with Stormvermin Fur and a Rakarth Flesh drybrush on the bases. I realised that it would make good base to do bone so a couple of layers of bone and white and the skulls were done. I am happy with outcome but glad I only had to do 5 models! Now planning on painting the Stormcast from the same box. Note from Matt - Ian mentions creating washes from base/layer paints, remember that Lahmian Medium is an amazing tool to create these washes.